People have been using diagrams to visually represent thoughts in a map-like format for centuries. 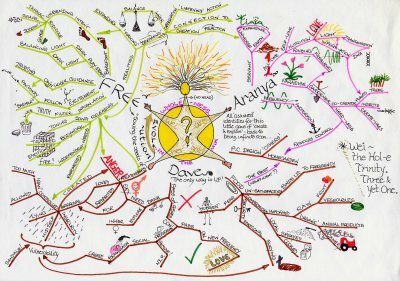 The actual term “mind map” was first made popular by pop psychologist Tony Buzan in 1974, with his idea of diagramming key words in a colorful, radiant, tree-like structure. Buzan said that “traditional” outlines force readers to scan left to right and top to bottom, but that readers actually tend to scan the entire page in a non-linear fashion (Buzan & Buzan, 1993). Another method of “thinking outside the box” is brainstorming, which is when a group of people get together and share as many ideas as possible without prejudice to create a new idea. The information is examined for likely solutions or innovative ideas after the session, but not during, to promote freedom of thought and a safe place for sharing ideas. Advertising executive Alex Osborn is credited with developing this technique as an alternative to the conventional business meeting, as he was frustrated by his employees’ inability to develop creative ideas (Shirey, 2011). However, individuals can employ this tactic of brainstorming as well. Free writing can also be a useful approach to get unstuck mentally. In brainstorming, ideas are listed out; whereas in free writing, you write full sentences and paragraphs. Freewriting entails writing continuously for a set period of time without regard for spelling, grammar or topic (Li, 2007).You don’t edit or censor your writing, you just write. While free writing, if you run out of things to say, you write about that until something else comes to mind. Often, this free-association will help unlock ideas to form new cohesive thoughts. Proponents of freewriting include Dorothea Brande in her 1934 book Becoming a Writer, Peter Elbow in his 1975 book Writing Without Teachers and Julia Cameron through her book The Artist’s Way, first published in 1992. So the next time you feel mentally stuck, try one of these methods to help generate new ideas and have fun with it! Want more resources like this? Sign up for our e-newsletter to get articles and resources relevant to gifted youth delivered straight to your inbox. Buzan, T., & Buzan, B. (1993). The mind map book. Rajpal & Sons. Davies, M. (2011). Concept mapping, mind mapping and argument mapping: what are the differences and do they matter?. Higher education, 62(3), 279-301. Li, L. Y. (2007). Exploring the use of focused freewriting in developing academic writing. Journal of University Teaching & Learning Practice, 4(1), 5. Shirey, M. R. (2011). Brainstorming for Breakthrough Thinking. Journal of Nursing Administration, 41(12), 497-500. This entry was posted in Gifted Resources and tagged brainstorming, free writing, mind map, problem-solving, strategies, Zadra Rose Ibanez. Bookmark the permalink.